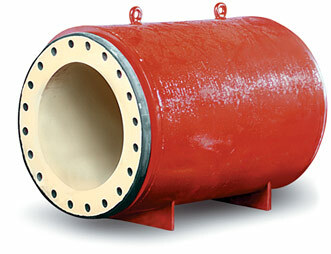 The Type A Megaflex is the most economical large diameter automatic valve available. First introduced by Red Valve, the Type A Megaflex Valve, available in sizes 20” to 84”, is extremely simple in design and principle. As with every Red Valve Pinch Valve, the elastomer sleeve is the only wearing part, drastically reducing maintenance costs. The Megaflex Valve’s full-ported actuation is accomplished by air or hydraulic pressure. The Megaflex Valve’s steel body acts as a built-in actuator, eliminating costly pneumatic, electric, or hydraulic components. Regulating and controlling the amount of different air pressure applied into the cavern between the outside of the sleeve and inside of the valve body will open, throttle or close valve. 15 psi over line pressure will close the Megaflex.Like all Red Valve Pinch Valves, Megaflex Valves are full ported. Thousands of dollars of savings are realized because Megaflex Valves have little head loss, substantially reducing pumping costs.Type A Megaflex Valves are often used as effluent discharge valves controlling raw sewage, storm overflow, flow equalization, tailings in mining operations, and bulk material handling.